Terrace, winter garden or a simple room – this is kind of buildings, which has no big requirements for isolation on winter time. 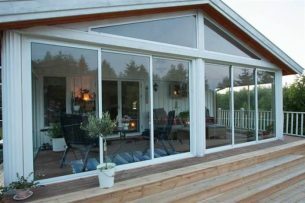 Generally, these and others, such as the balcony or summer house, can be glazed with our aluminum winter garden sliding system. Mini aluminum frames save space. Besides, there is a wide opening opportunity in combination with railings and sliding door system. Rails. A few opening options You can choose with a single rail – it can be hidden inside the wall. It is possible to have two, three or even four railings system, which allows to open very widely. Also, a standard or special frame painting colours are available. Single rail can be hidden inside the wall. The similar situation is with three and two rails. Another option of the same construction – closed, not opening windows. Our mini framed winter garden sliding door systems are sealed, maintenance free and safe. For that kind of sliding systems, we use 4 or 5 mm thick tempered glass. You can also choose tinted (darker glass). Aluminum framing standard colours – white and natural aluminum colour. As usually, it is possible to paint frames by technology with any other RAL colour for additional cost. Because of the painting technology, You will not need to think about repainting for a long time. Every rail is three centimeters wide and three centimeters high (3×3). As for an example, when it comes to four rail system, it means that the step will be 3 cm high and 12 cm wide (3×12). When it turns to two rails – then it will be 3 cm high and 6 cm wide (3×6). Lock and handles. Normally, winter garden sliding system parts go with a standard handle from inside. It is not possible to access from outside, until the handle from inside is unlocked. If an access from outside is required, then we can produce a sliding part with a lock from outside, as well. Accordingly, when the sliding parts are closed – it stands stable and sealed, no sound of wind. Gaskets and brushes will ensure silence in the wind and no vibrations. If the glazed balconies are high up, You can take the sliding parts out from the railings easily, clean them and put back after all. Aluminum profiles do not move. This is because of the temperature difference, that’s why it is good for all climate types. REYNAERS CP68 – system with double or triple glazing (full isolated). Below you will find a wider description of each profile. It is uninsulated sliding system with a single or double-glazing possibility. Ideal for uninsulated flats, winter gardens, balcony glazing’s, terrace glazing’s. Besides, REYNAERS CP45 PA system can be produced with a single or up to 4 rails system, which guarantee a large opening area. Same as other systems, customer can choose to have key lock outside or just handle without lock inside. Apart from this, a minimalistic design realises an aesthetic solution for Your building. Sliding elements can be easily integrated with a different type of windows, conservatory, sun screening. Standard colours or special painting – all depends on Your wishes. The system height can be up to 2700 mm high, depending on a wind load resistance. REYNAERS CP 50 is an isolated and elegant sliding system, slim and lightweight. 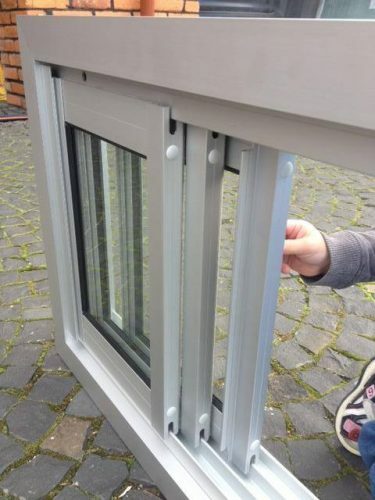 This system most popular to produce with double glazing (24 mm), but also possible with a single glass (6-8 mm). REYNAERS system is designed according to the highest European quality standards. CP 50 sliding system offers many different opening possibilities up to 3 rails system. Same as other systems, customer can choose to have key lock outside or just handle without lock inside. Max 2700 mm height construction allow to have big glazing areas for Your balconies, terraces, winter gardens. A standard colours or special painting – all depends on Your wishes. As a matter of fact, with REYNAERS CP 50 we can reach max U=2.0 Wm2K value (together glass with a frame). Very well isolated sliding system that combines elegance and performance, U value and security. This unique sliding system is characterised by its slim profiles, allowing the integration of large windows and doors for a maximum view. As advantages, innovations and technologies guarantee wind and water tightness and thermal insulation, meeting with the highest standards. The sliding system CP 68 offers up till 3 railings and up to 2700 mm high construction. Same as other systems, customer can choose to have key lock outside or just handle without lock inside. A standard colours or special painting – all depends on Your wishes. With REYNAERS CP 68 we can reach max U=1.7 Wm2K value (together glass with a frame). Moreover, this is a perfect system for those who has full heated balconies and winter gardens. It is possible to produce this system with 28-36 mm thickness of glazing, which means with 2 or with 3 layers of glass. In spite of the great U value, sound isolation is also a benefit. NOTE: for those customers, who would like to have sliding systems U value better than U=1.7 Wm2K, we can offer other REYNAERS, GEALAN or SCHUCO profile systems.